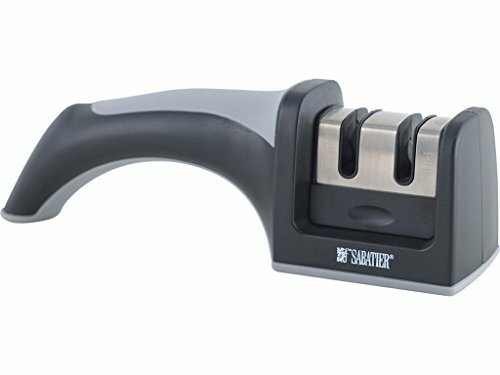 A premium brand used by professional chefs around the globe with a heritage dating back to the 1800â€TMs, this Sabatier Classic Knife Sharpener is of exceptional quality. This knife sharpener has two slots, one marked â€˜coarseâ€TM for dull knives and the other marked â€˜fineâ€TM for honing sharp blades.Directions:1. Clean the blade before sharpening.2. Hold the knife sharpener firmly on a secure flat surface.3. For dull knives, using the â€˜coarseâ€TM slot first, place the knife blade in the slot and move the knife smoothly back and forth along the length of the blade until sharp.4. Once the blade is sharp, repeat the back and forth process in the â€˜fineâ€TM slot to hone the edge further.5. Clean the blade again after sharpening.Measurements: 19cmRenowned for the finest quality of work, traditional French craftsmanship and passionate attention to detail, Sabatier represents the very best in contemporary design. Crafted in the refined spirit of European tradition with modern tones that make all products durable and comfortable to use.